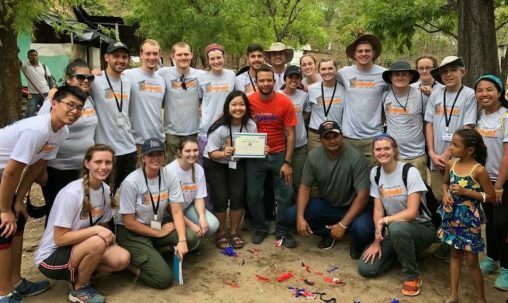 Last year, Wright State’s chapter of the Global Public Health Brigade was the first to begin work on a water brigade in Nicaragua. 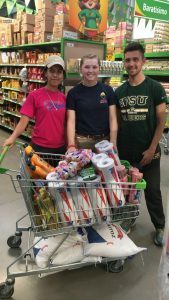 This year, students in the chapter were the first to begin working in San José, El Sauce, León, a town in Nicaragua. Wright State students built showers, latrines, a place to wash clothes and a place to store water. They also dug trenches to install piping for a biodigestor, which will help maintain the structure for 50 years. They educated the people in the community about the importance of water. Through a partnership with Days for Girls, the students also provided female hygiene kits to the women in the community. Global Brigades is an organization that assists communities in several Central American countries with medical needs, dentistry, business, public health and legal assistance for families. The organization’s mission is to empower communities to reach a strong level of sustainability. Kristie Dinh, a junior biological sciences major and founder of the Global Public Health Brigades chapter at Wright State, said she loves the organization for its sustainable work. From left: Tania Ruiz, who translated for the Wright State chapter, and students Gina Gano and Tanner Mathes. For Dinh, making relationships with the people they helped was one of her favorite parts of the trip. “I fell in love with the community members, who were all so kind and generous. They helped us build the structures and opened both their homes and their hearts to us,” she said. Katie Muterspaw, a biological sciences major who participated in both trips, said the health brigade project forces you out of your comfort zone. “You have to try new food, perform hard labor and learn to speak a completely different language,” she said. Despite being outside her comfort zone, Muterspaw said the trips have made a huge difference in her life.